* Department "Oral and Image Diagnostics", Faculty of Dental Medicine - Sofia, Bulgaria. *** NCIPD - National Centre of Infectious and Parasitic Diseases, Bulgaria. The teeth and teeth rows restoration in the maxillofacial area is the last stage of the ongoing patient treatment and a basic purpose for the dental doctors. For this purpose a different set of modern and classic contemporary dental materials is used. The choice of each material during the treatment of every patient with proven allergy to different kind of allergens is very specific and strictly individual. In the everyday oral diagnostics a standardized set of allergens for diagnostics is used for proving the allergy to dental materials. The set has been developed on the base of all existing and permitted by the Bulgarian authorities dental materials, as well as professional series. The difference between the developed and standardized allergens for diagnostics used in our country and the existing ready-for-use series is that the first are made of the final product (material) in the form introduced to the oral cavity and persisting there for a different period of time, sometimes for tenths of years. This enables the possibility for early or late contact allergic reactions with symptoms in the oral cavity and on the skin, maxillofacial area, head and neck, as well as the entire organism. 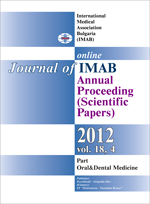 The current article introduces the readers to the results obtained by the realization of the research project №28/2011 “Research on the type of sensibilisation to contemporary dental materials and development of set of allergens for its diagnosing through epicutaneous patch testing” funded by the Committee of Medical science of MU Sofia (CMC). Through the project became possible the creation and the initial research of the first Bulgarian series for epicutaneous testing whose aim is to prove the allergenic potential of the most frequently used by the dental doctors dental materials. Key words: Dental clinical allergology, Allergy to dental materials and dental alloys, Bulgarian allergenic materials for diagnostics. 8. Kisselova-Yaneva, A. Reactions to materials used in dentistry. Godishen sbornik IMAB, 2001, 7(2):135-136. O’Connor WJ, Rogers RS, Sheridan PJ, Reeve CM. Allergic contact stomatitis, a 20 year experience. J Eur Acad Dermatol Venereol. 1997, 9(Suppl.1):163-163. Tosic, G. Occupational hazards in dentistry - part one: allergic reactions to dental restorative materials and latex sensitivity. Facta Universitatis, Series: Working and Living Environmental Protection 2004; 2 (4):317-324. 23. Wataha JC. Biocompatibility of dental casting alloys: A review. J Prosthet Dent. 2000 Feb;83(2):223-234. [PubMed].